Hey guys, thanks very much for agreeing to this interview. Would you guys mind introducing yourselves? Kay: Hello Hello my name is Kay and I currently play guitar and sing in candy claws. Ryan: HIHI I’m Ryan and I play keyboards and produce the music. So, how did you guys get together to create Candy Claws? Kay: Ryan and I became friends when I was a teenager back when he was my drum teacher. We found that we had so much in common (like humor, art interests, music taste, and so on) we decided to combine our talents to make a fun project. Thus the candy claws was born! In 2009 you released In the Dream of the Sea Life. What can you tell me about making this album? Are you guys satisfied with how it turned out? Kay: In the Dream was sort of a explosion of Ryan’s new wave of creativity and my first experience with making music. I guess it was a combination of Ryan being really experienced and me being sort of a naive about music making. I think it worked out well. I love In The Dream. I think it reflects our thoughts about the sea accurately. Ryan: It was an experiment to see what we could do with making music on a computer. There are so many ways to manipulate sound digitally, it really opened up our imaginations. We recorded in tiny bits and pieces, a guitar line here, a drum hit there, and put them all together into songs. We’re very happy with how it turned out. We never release anything we’re not overjoyed about. Kay: I don’t know if these bands really influenced our music much but I love bands like Portishead, Radiohead, Midlake, Bjork, and The Beatles. Ryan: I’d day Starflyer 59, the first Goldfrapp record, Cornelius, My Bloody Valentine, the Beach Boys, Macha, and Frank Comstock. 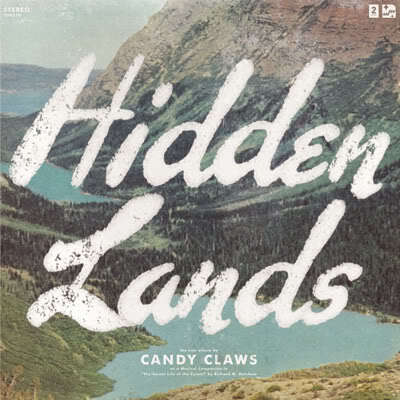 You released Hidden Lands in August, 2010. What can you tell me about this album. I would love to hear a story about making it and what was main influences. Kay: For this album we recorded all the lyrics in one week when we were house sitting for our friends family. It was really surreal because we did the same routine for a week straight. We would sleep-in on the couches, wake up and make breakfast, feed the dog, start recording till late, then I would go to sleep and Ryan would play video games and eventually go to sleep. Then we did the same thing over again the next day. When the week was over I felt like we spent the entire time in a bear cave and our skin was pale and our faces unshaven. Ryan: We made this record in two different winters. Kay told you about the second one, with vocals. The first one I spent hiding in my room, figuring out how many different sounds I could get out of these two tiny Casio keyboards. This album is calmer than our first, to give you the feeling that you have found a safe home, hidden in the forest. Ryan: Our next record will be a musical companion to the Mesozoic Era. Kay: I like coffee ice cream very much. Ryan: I like ice cream coffee almost more. Excellent interview! Very nice to know more about this wonderful band.